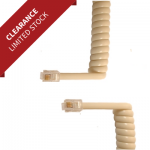 A selection of RJ10 leads and accessories. RJ10 connectors are also know as RJ9 and RJ22 but these are all the same thing. 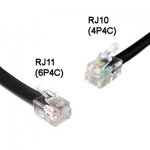 If you’re looking for the official name for an RJ10 connector it’s 4P4C which basically means 4 pins and 4 connections. 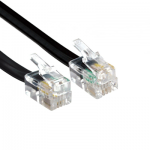 You can find out more information about identifying RJ connectors on our Technical Library under our Network Wiring page. If you can’t find what you’re looking for feel free to Contact Us, or if you would like a custom length made we can make any lead to any specification at surprisingly low cost.